Whenever I’m asked what my favorite city and country is, I always say Firenze in Italy. I know it’s touristy, I know it’s overcrowded, I know it’s considered by some as a cliché, but I really just fell in love with the city. There are just so many things to do in Florence, so many places to see. Even just sitting in the plaza and people watching is an experience in itself. One vivid memory I’ve had of Firenze was in Piazza del Duomo, in front of the Florence Cathedral (a.k.a., Il Duomo di Firenze). There are a number of benches there, and I sat down to read while waiting for my Couchsurfing host to come and pick me up. At some point, two people sat beside me and a few more sat on the ground in front of me. I noticed them vaguely but continued reading. That is, until they started playing. 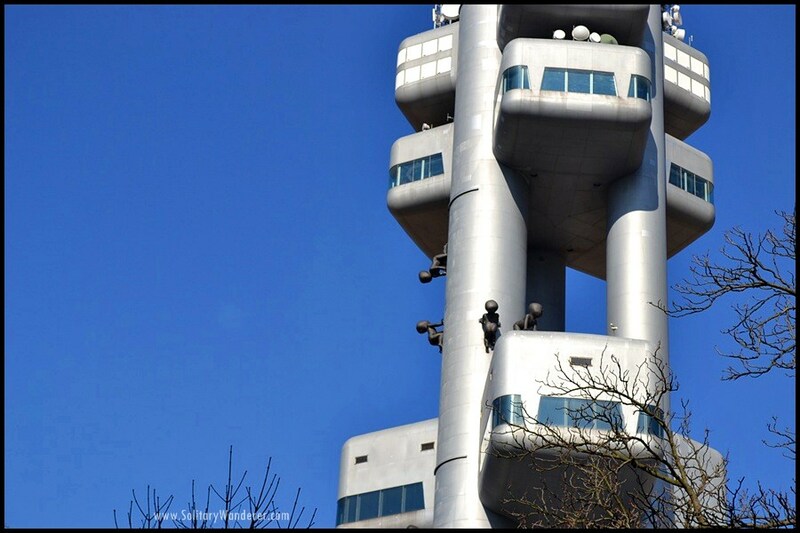 When I looked up, I realized that a huge crowd had formed in front of us, watching/listening to the musicians play. Embarrassed to be the center of attraction, I pretended to continue reading. Hanging out at the Piazza del Duomo. Before long, however, I felt the traveler’s high wash over me. Beautiful music + cool spring weather + the Duomo = it was a perfect moment that I didn’t want to pass. Pretty soon, the musicians stopped playing, packed up their gear, and left. I felt lost, and was just about to leave as well when someone spoke. “What instrument did you play?” he said. “Just my Kindle,” I replied. Jerome told me more about himself and then invited me to watch a Korean film that night, because he was going back to France the next day. Unfortunately, since I’d already made plans with my CS host, I regretfully had to decline. We exchanged emails and promised to keep in touch. Though that was a very brief encounter, meeting Jerome was the perfect ending to a perfect day in Florence. We never managed to meet again, although we did keep in touch for years. It didn’t matter; traveling is all about moments like those — short, ephemeral, and for some, unforgettable. In my Couchsurfing host’s 15th century home in Florence. If you only have a few days to travel around Italy, I would really recommend spending them in Rome and Florence; Rome for its historical and religious significance, and Florence for culture. In fact, Florence is Italy’s cultural capital. It is a city lost in time with so many historic buildings, churches, and museums that contain some of the world’s most famous work of art. It has plenty to offer all kinds of tourists, including great food (I had my best gelato in Florence!). I highly recommend spending at least a week in Firenze. There are just so many things to do in Florence that it’s easy to get overwhelmed if you’re spending only a few days there. I also recommend bringing a pocket Wifi with you. There are Instagrammable places in every corner (if that’s your thing) and it pays to be connected. No matter how long you’re staying in the city, make sure to check out some (or all) of the following things to do in Florence when you go visit. A replica of the Statue of David in Palazzo Vecchio. UNESCO cites that around 60% of the world’s most vital artworks are in Italy and about half of those are in Florence. You can’t go to Firenze without seeing at least a handful of art made by Michelangelo, Filippo Brunelleschi, Donatello, Fra Angelico, and others. Michelangelo, probably the world’s most famous artist, is well represented in the city; many of his best and popular works are on display. 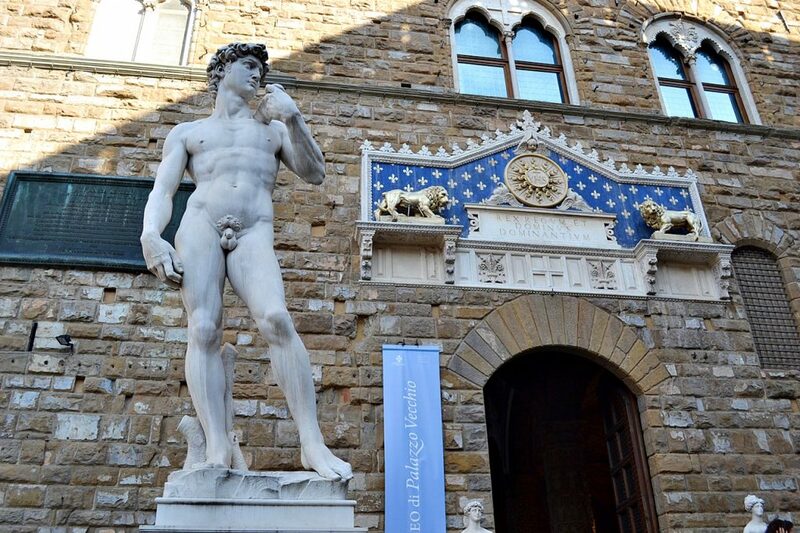 One must-see from him is the Statue of David, which you can see in the Accademia. You’ll also see a replica of this at the Piazzale Michelangelo and the Palazzo Vecchio. The Renaissance period produced some of the most famous and groundbreaking paintings of that century; one of which is The Birth of Venus made by Sandro Botticelli. You’ll find the fetching young woman standing on a shell in the Uffizi Gallery. Masaccio also has a beautiful painting worth adding to your itinerary; his famous work The Holy Trinity is on display at the Piazza di Santa Maria Novella. 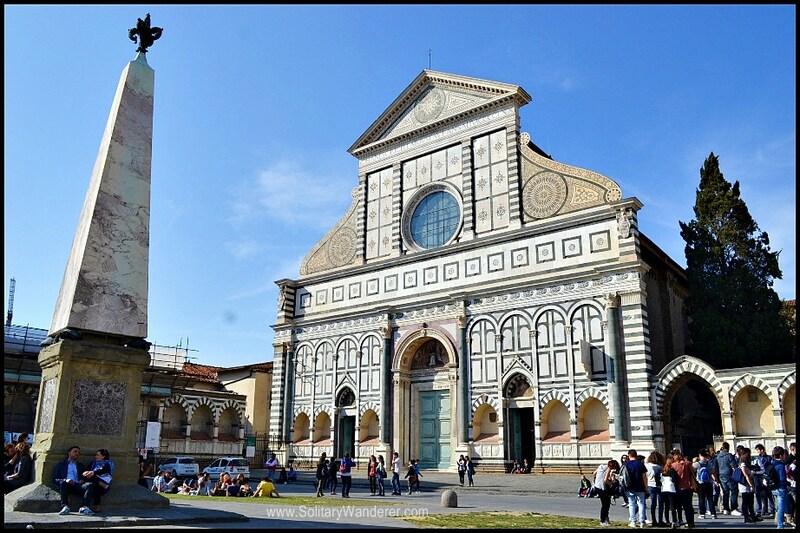 The beautiful façade of the Basilica of Santa Maria Novella. As a city where past and present collide, you’ll see stunning architecture and buildings that withstood the test of time and are still an important part of Florence’s identity. Get lost in the streets and marvel at the works of the masters. 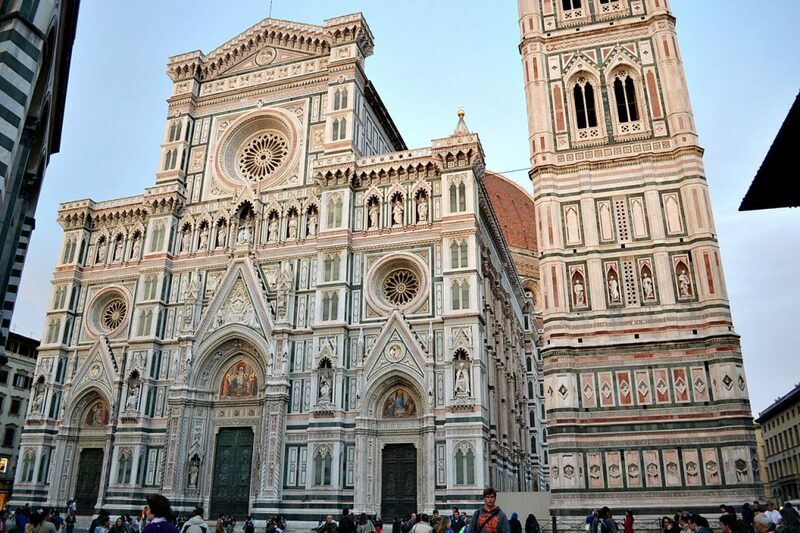 Atop your bucket list of marvelous buildings to see in Florence is none other than the Florence Cathedral. it is an impressive structure that took more than a century to finish. 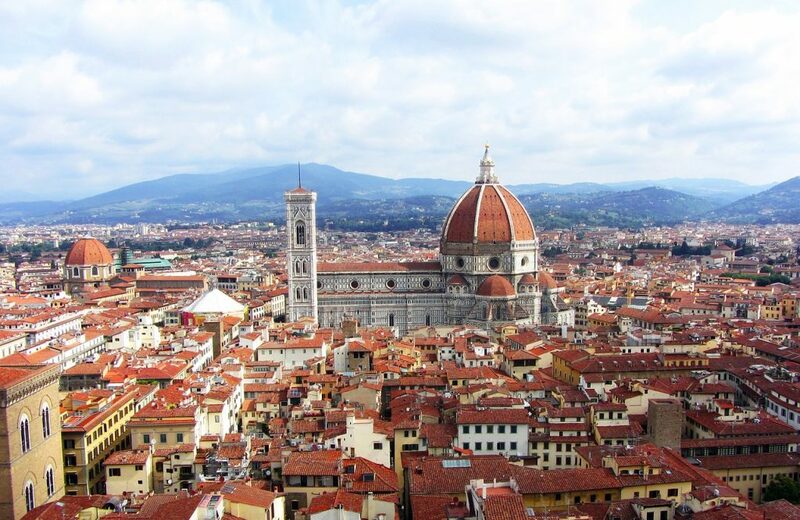 Fillipo Brunelleschi took on the task of creating a dome big enough for the massive church. Many of the finest structures and displays of architectural prowess in the city have Christian influence. Another such example is the Basilica of Santa Maria Novella; this is one of the oldest churches in Florence and is one of the best examples of Renaissance design. You also have the chance to see “The Holy Trinity” there during your visit. The Pitti Palace is a fine example of the design and architecture of its period with its adherence to symmetry. It has survived and thrived for centuries, and is a prime tourist attraction. It is also one of the biggest museums in Florence. The Bargello is another architectural wonder in a city that has plenty. Its distinguishing features are the bell tower and its fortress-like foundation. The building has undergone many transformations over the centuries from a city commune to a prison and then an art museum. Also known as the “Old Bridge,” and featured in several Hollywood movies including the Dan Brown films, Ponte Vecchio is an important part of Florence. It has withstood centuries, survived a war, and nature’s devastation. Ponte Vecchio was initially just a connecting way to keep the Medici out of contact with their subjects after they transferred from Palazzo Vecchio to Palazzo Pitti. Fast forward to today, it is now a very famous tourist destination with shops that resemble suitcases on both sides of the bridge. 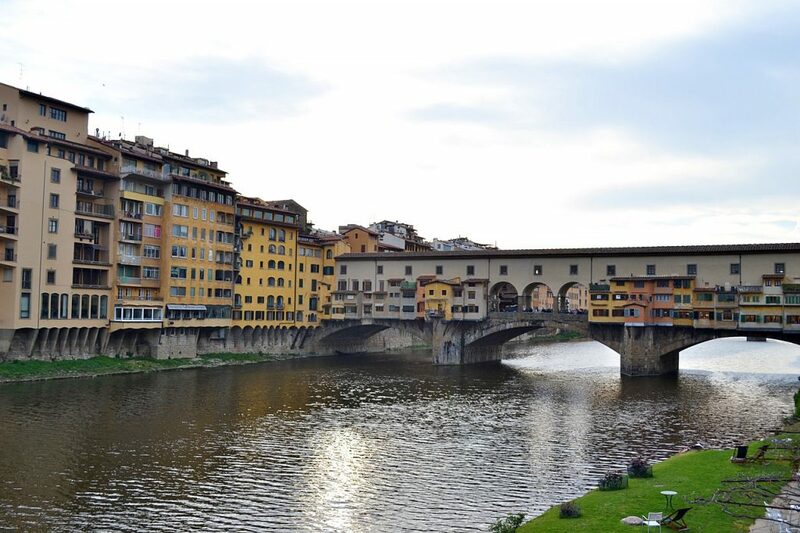 Take a leisurely stroll crossing and re-crossing the Ponte Vecchio. On a clear day, you might see a picture perfect reflection of the structure and stores on the clear waters of the Arno. You will also have the chance to marvel at the beauty of the bridge from below through the occasional boat ride and theater productions. 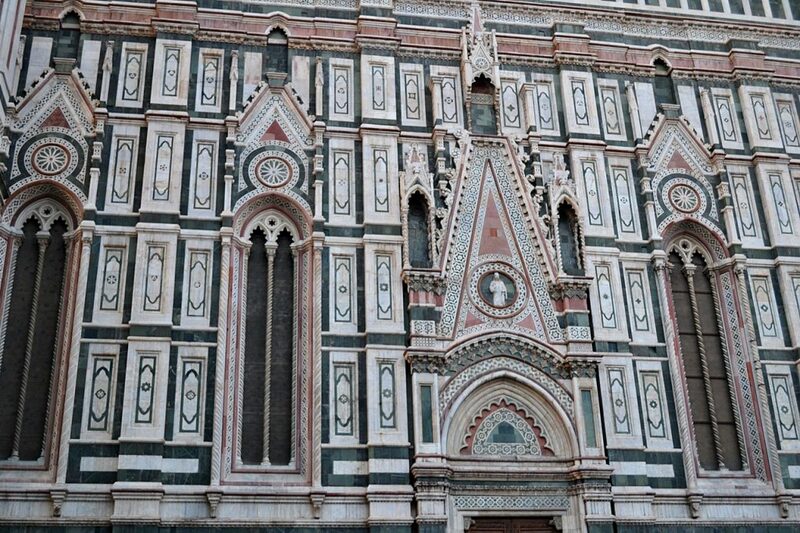 Detail of the Florence Cathedral. Beauty is already all around you while exploring Florence, but for those who want a bit more information about what they see, a trip to a museum is a must. The city has plenty of museums to keep you busy for a day or two. The Galleria dell’Accademia is one of the most famous museums in the city. The gallery houses the renowned sculpture of David by Michelangelo. It may not be as big as Uffizi, but it more than makes up for it with quality works you’ll find during your trip. You could see most if not all of the exhibits in the morning, meaning you’ll have more time visiting other destinations in your itinerary. The Museo dell’Opera del Duomo is another noteworthy museum to add to your itinerary if you are interested in Catholic influences in the history of the country, architecture, and politics. You can also go to the Leonardo da Vinci Museum, which is dedicated to the masterpieces and creativity of da Vinci. Its main draw is the interactivity of the machines and models on display. If you’re like me and just want a slow way of traveling, definitely spend some time hanging out in the piazzas of Florence. They are eye candy; they represent the artistic expression of their age and are at the center of social life. Chill and enjoy one of the world’s most renowned city views in Piazzale Michelangelo. This is the place where you can get a glimpse of the entirety of Florence. Some of the attractions you’ll see from a distance are the Duomo, Ponte Vecchio, and the Santa Croce. 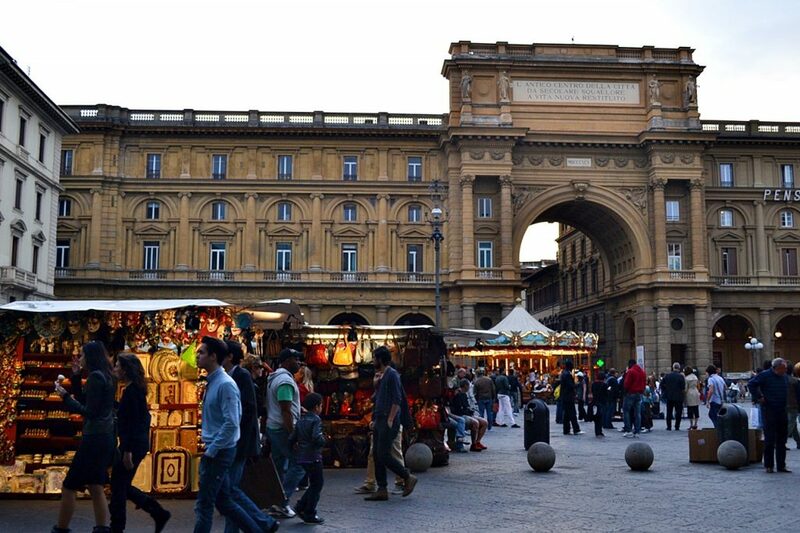 Piazza della Repubblica is a culturally and historically significant destination to explore and experience. It marks the city’s center since the time of the ancient Romans. The column you’ll see is centuries old and dates back to the 1430s. The Piazza del Duomo is a great place to hang out in with the many cultural and historical wonders you’ll see while exploring. You’ll see the famous dome, the cathedral, and some exquisite architecture. 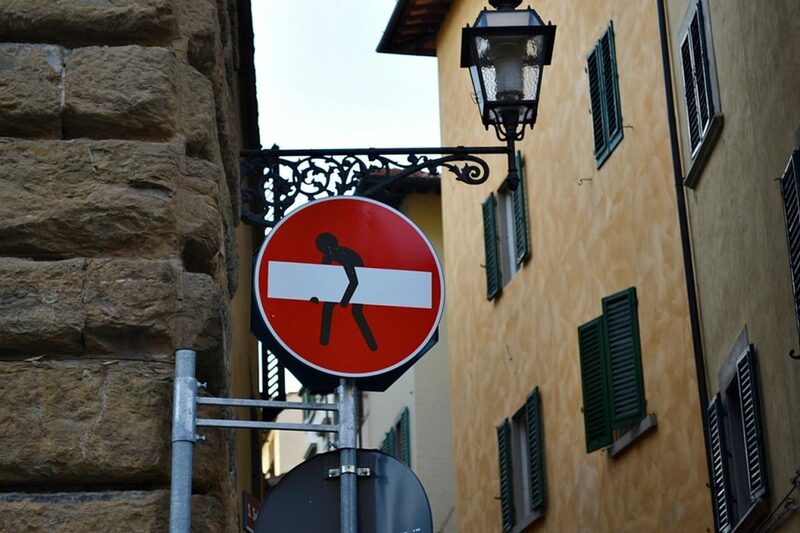 Keep on the lookout for these funny street signs in Florence. Florence is indeed a very fascinating city that requires days (or weeks!) to experience and explore. The artworks, the architecture, and the romantic ambiance will make you keep coming back for more. There are so many things to do in Florence that you’ll find yourself wishing to go back there again and again! Have you been to Florence? What was your first impression of it? There is a certain amount of romance associated with Florence which I really love! The city has beautiful architecture, and like you said, 60% of the world’s artistic gems, it’s such an amazing city to walk around in, or visit the museums and look at the brilliant pieces of art! LOL I love those funny street signs. Brilliant. With all the beauty in Florence I’d be snapping these shots and sharing to Instagram. Rocking post buddy. We were in Florence for one hot and crazy day during August and I’ve always wanted to go back when it’s less crowded. Your post has given me enough inspiration to start planning that next trip. I love the story about how you became the centre of attention in front of the cathedral and how you kept in contact with Jerome for years! Isn’t that what travelling is all about? Italy is Love. I loved your story of meeting Jerome and the musicians. The street signs are really interesting and I would droll over the Pizzas. Florence surely has a great architecture and would love capturing them through my lens. I’ve been to Rome, but not Florence. I really would love to go there though. The architecture is really incredible. Plus, there’s the Italian food. Amazing. Florence is so pretty in pictures. I’m sure it’s even better in person. 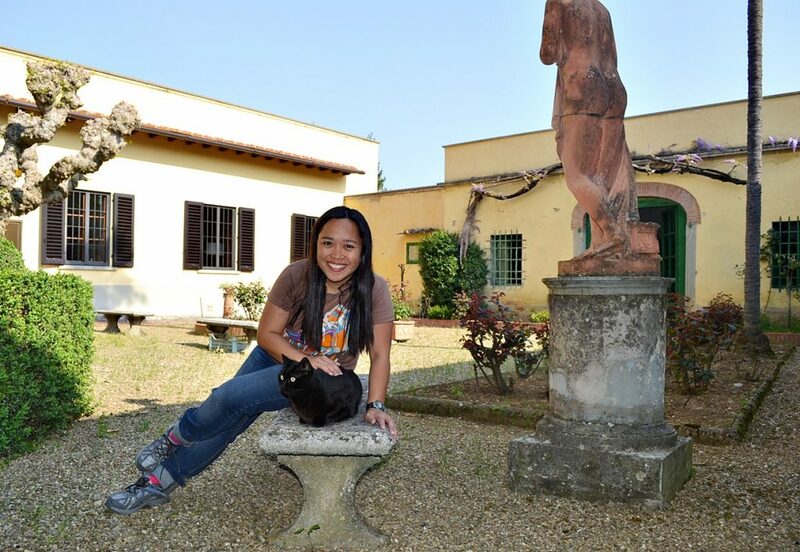 Florence has so many destinations but couch surfing at a 15th century house with cat include – totally fabulous. I think Florence might by the best city for me to visit in Italy. It has all the big city flair, but the countryside is calling just beyond the town. You can get the best of both worlds in a single trip. Ok….so I am not a museum guy, but my wife loves them. If you had to pick one (or maybe two if it was super unique), what museum should we see on a Florence visit? Thank so much! You’re right, Florence is overcrowded, it is over touristy – Yet I still want to go! – you’ve picked out some great places to visit and will keep this post in mind for when I do go myself – Isn’t this what traveling is all about – those moments when something unexpected happens but the memory of those musicians sitting next to you, the crowd around you – whenever you’re having a down day to be able to think of that moment to bring a smile to your face. My favourite part of this post is that lovely memory you shared of the musicians on the bench, and meeting Jerome. As you say, it’s these little moments that are to be cherished just as much as seeing the sights themselves. Oddly, although I’ve visited Italy many times, I’ve not yet made it to Florence, I really need to rectify that soon! Had a day in Florence in 2015. Definitely not enough because we were not able to go to the Uffizi and the Ponte Vecchio. But I was able to buy a leather purse at the leather school behind the Santa Maria Novella! I love Florence. I’ve been to Italy three times in the past 2 years and will likely be calling it my home base soon. I had a memorable 3 days in Florence visiting much of what you did too and agree that it is an amazing city! Great post!